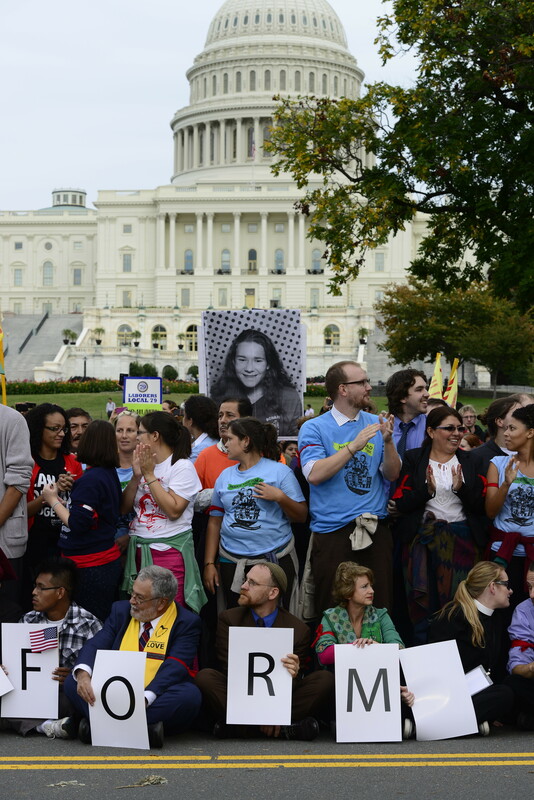 Last week, the Jewish social justice group Bend the Arc joined a clamorous immigration reform rally on the National Mall in Washington, DC. And back in June, the Conservative Rabbinical Assembly gathered the signatures of 1,300 Jewish clergy from different denominations on a joint letter to Congress calling for an overhaul of current immigration policy. Jewish involvement in Latino political interests is by no means a recent phenomenon and the relationship between the two communities has certainly come to bear at the ballot box, from Los Angeles to New York. Indeed, a growing, thriving American Jewish-Latino coalition, defined by politics, economics and cultural cooperation, is starting to come into focus. According to the Bend the Arc website, organizers estimated around 15,000 people attended the rally. You can find more information about the rally on the Bend the Arc site. In recent years, Jewish political organizations have redoubled efforts to petition Latinos in the Hispanic Caucus for their support of Israel. AIPAC boasts a Hispanic outreach branch to educate Latinos on how to lobby their congressmen to support Israel. J Street, the “pro-Israel, pro-peace” lobbyist group, secured the signature of the Hispanic Caucus chair for Palestinian aid. The David Project, a pro-Israel advocacy group, has been reaching out to Latino students on American college campuses. And public figures, such as newly minted Los Angeles Mayor Eric Garcetti, are putting the American Jewish-Latino binary in the spotlight. But what is behind this upswing in coalition-building initiatives? Thus far, the answer lies in a clean political exchange: Jewish groups want a massive Hispanic constituency to help with Israel advocacy and, in turn, the Jewish power base can help Latinos appeal for immigration reform. Immigration and Israel are the obvious political starting points between the Hispanic and Jewish communities. According to American Jewish Committee Latino and Latin American Institute director Dina Siegel Vann, it is vital, then, that the American Jewish community, whose population of roughly six million is a fraction of the nation’s 52 million Latinos, build bridges with a growing and increasingly influential demographic. But immigration and Israel should not be the totality of efforts to strengthen the inter-ethnic relationship, says Siegel Vann’s co-director Stephanie Guiloff, a Latina Jew of Chilean descent. It is true, Siegel Vann and Guiloff say, the lion’s share of outreach is being done by Jewish organizations. What may keep the efforts from bearing fruit is Latino indifference. “Maybe coalition building with Jewish organizations is not a priority for Latino organizations,” Guiloff says. And, as Siegel Vann points out, this could be because Latinos see Jews as part of the white majority, not a community with which they should caucus. The reality, according to a 2011 Latino Decisions survey conducted on behalf of the AJC, is much more nuanced: Latinos see the Jewish community in a kind of ethnic limbo, at once a minority and part of the Establishment. The survey polled 2,000 Latinos from five metropolitan areas: Chicago, Kansas City, Los Angeles, Miami and New York. The poll found how Latinos see Jews does not point to monstrous anti-Semitism but rather to non-familiarity. Forty-one percent of respondents said they don’t know “any Jews at all” and know “nothing about Jewish religion.” Fifty-nine percent said they “never interact with Jews.” Why is this so important? As the survey authors say, the more familiar Latinos are with Jews the more positive their attitudes and perceptions of the community. Conversely, the less a Latino group was familiar or interacted with Jews, the less positive their view of the community and the less likely they were to view Jews as political partners. What is clear to Siegel Vann and Guiloff is that the Jewish community has to engage in strategic and targeted interactions with Latinos that transcend the political relationship through education, leadership experiences and friendships. One example is an AJC-sponsored program called Project Interchange, which sends non-Jews, like UC-Irvine political science student Maritza Mantilla, on educational missions to Israel. “The trip to Israel truly gave me a deeper understanding of the country and culture,” says Mantilla, adding that Yad Vashem, the Holocaust museum, helped her relate to the Jewish experience. Although the survey targeted familiarity and attitudes toward Jews and foreign policy, it is the familiarity measure that defies previous surveys because the correlation between lack of knowledge and attitudes or sentiments towards Jews is, on some level, fixable. In other words, there is hope. The question, then, becomes how to foster understanding. In part, familiarity will be mended by the younger generation of Latino Jews – the Jewbans, Jewtinos and Jewminicans celebrating their hybrid identity and engaging with contemporary American Jewish life with orgullo, or pride. And also with organizations like Alianza, a Jewish-Latino alliance started at the University of Pennsylvania in 2009. “When I arrived at Penn, I became involved both with Hillel and the Latino Coalition,” says founder Jona Ludmir, who has Peruvian, Argentinian and Jewish heritage. Bridget Kevane is a professor of Latin American and Latino literature at Montana State University in Bozeman. Her work has appeared in Tablet, The Jewish Daily Forward, The New York Times Book Review and ZEEK. She is writing a book titled Jewish Latino Culture and Politics.